As the last stop before a (surprise) romantic trip to Paris and with the longest Champagne bar in Europe, The Searcys Bar at St Pancras is fast becoming the ideal place to propose. To add to the romance, the Champagne Bar is just below the famous 30ft lovers statue ‘The Meeting Place’, a gentle reminder of the romantic nature of train travel, and Tracey Emin’s evocative artwork in bright pink neon: ‘I want my time with you’. Searcys will give you a helping hand in the proposal department with a new edible engagement ring box to present to your loved one as part of our engagement package. 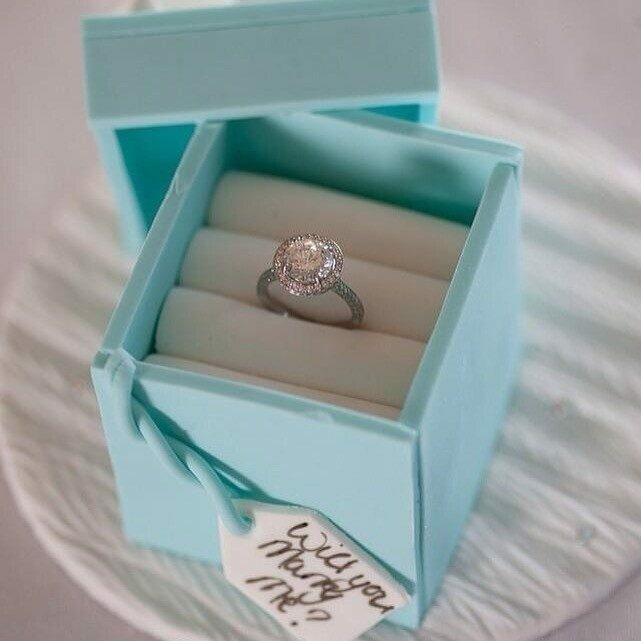 The delicious turquoise ring box is created by purveyors of luxury cakes GC Couture, who regularly supply wedding cakes for 5 star hotels in UK and internationally. Covered in fondant icing, the cake box can be ordered as little as three days in advance, under two different packages: £200 with two glasses of Searcys Selected Cuvée Champagne, or a full package for £265 which includes two glasses of Searcys Selected Cuvée Champagne and a seasonal food platter to share.